Insull served as personal secretary to Thomas Edison, eventually taking control of most of the Edison General Electric Company. His experience in the electric industry and keen optimism for its future led Insull to his development of an enormous utility holding company with assets in excess of two billion dollars. His pyramid of holding companies collapsed due to the combination of his highly leveraged position and a September 1931 stock market crash. In April of 1932, the top Insull companies went into receivership, thus ending the reign of one of America's leading symbols of prestige and business success of the 1920's. 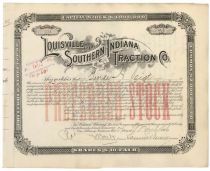 Insull's signature is rarely encountered on stocks/bonds other than his Louisville and Northern Railway and Lighting Company. 1906, Indiana. Stock certificate for 43 shares. Black with light red PREFERRED STOCK overprint at center. Flowers in the ornate company title. Signed as president by Samuel Insull (1859-1938). Public utility magnate. Insull served as personal secretary to Thomas Edison, eventually taking control of most of the Edison General Electric Company. Very fine condition. Stamp and cut cancelled with the paper removed at the Treasurer's signature. Insull's fine signature is uncancelled. 1912, Indiana. 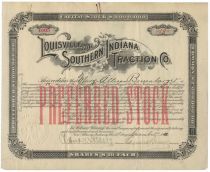 Stock certificate for 13 shares of the Louisville and Southern Indiana Traction Co. Black with orange overprint. Small flowers intertwined in title. Signed by SAMUEL INSULL, as President. (1859 - 1938). Public utility magnate. Insull served as personal secretary to Thomas Edison, eventually taking control of most of the Edison General Electric Company. His experience in the electric industry and keen optimism for its future led Insull to his development of an enormous utility holding company with assets in excess of two billion dollars. His pyramid of holding companies collapsed due to the combination of his highly leveraged position and a September 1931 stock market crash. In April of 1932, the top Insull companies went into receivership, thus ending the reign of one of America's leading symbols of prestige and business success of the 1920's. Insull's signature is rarely encountered on stocks/bonds other than his Louisville and Northern Railway and Lighting Company. Light traces of rust from paper clip at top edges. Uncancelled and fine. 1907, Indiana. Stock certificate for 50 shares of the Louisville & Northern Railway & Lighting Co. Green/Black. Interesting vignette of a street railway car flanked by early lighted electric bulbs. Signed as president of the company by SAMUEL INSULL (1859 - 1938). Public utility magnate. insull served as personal secretary to Thomas Edison, eventually taking control of most of the Edison General Electric Company. His experience in the electric industry and keen optimism for its future led Insull to his development of an enormous utility holding company with assets in excess of two billion dollars. His pyramid of holding companies collapsed due to the combination of his highly leveraged position and a September 1931 stock market crash. In April of 1932, the top Insull companies went into receivership, thus ending the reign of one of America's leading symbols of prestige and business success of the 1920's. Diamond shaped cancellation at the officers' signatures affecting the "uel" in Samuel. Minor paper loss at upper margin. Overall fine. 1906, Indiana. Stock certificate for 25 shares of the Louisville & Northern Railway & Lighting Co. GreenBlack. Interesting vignette of a street railway car flanked by early lighted electric bulbs. Signed as president of the company by SAMUEL INSULL (1859-1938). Public utility magnate and personal secretary to Thomas Edison. Diamond shaped punch cancellation at the secretary's signature not affecting Insull's as president. Fine.